(Pearl Crescent Butterfly (Phyciodes tharos) - 01) We had a hard time trying to specifically identify this butterfly. The color markings are are almost identical to the northern crescent butterfly, but according to the literature, their flight times are mid June through July, and we took this photo in September, while the pearl crescent's flight times are from April through November. 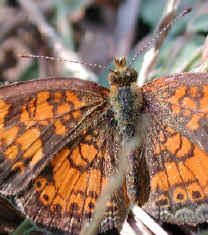 The pearl crescent butterfly has a yellow band in the outer (lighter color) area of the forewings; however, according to the literature, the males are orange, as this one, and the literature goes on to say that the antennal knobs of the males are usually black. Thus, we have qualified our identification, which in no way limits our enjoyment of the wondrous variations in God's creation. (Pearl Crescent Butterfly (Phyciodes tharos) - 02) This enlarged photo of this pearl crescent butterfly does show the right antennal knob to be darker, indicating that this could be a male pearl crescent. In this photo, we can also see "feather-like structures" extending out from the thorax and sweeping back along the abdomen on top of the wings. We couldn't find any information about these structures in the literature; perhaps one of our readers could assist us with this. Please refer to "glf-butterfly-pcrescent2" when writing. This butterfly also seems to be covered with pollen grains, possibly from asters, which were in bloom and are their host plant. (Pearl Crescent Butterfly (Phyciodes tharos) - 02a) The actual size of the pearl crescent butterfly is about 1-1/2 inches across, plus or minus 1/4 inch. The northern pearl crescent is slightly smaller, ranging is size from about 1 inch to about 1-1/3 inch. We also found one piece of further confusion in the literature, which indicated that northern pearls are slightly larger than the pearls, which is counter to the sizes indicated above. We estimated the size of this butterfly to be slightly over an inch across its wing span. Since there is so much evil and destruction in the world, we're thankful to be able to put it aside for a while as we enjoy this and other members of God's little folk, and the other wonders of God's creation. Let us work together to preserve and restore our environment for all future generations.